Finance minister Mthuli Ncube on Friday said the $8,2 billion budget for 2019 will address the currency crisis bedevilling Zimbabwe in the next few months, saying the shortage of the United States dollar was being caused by financial indiscipline. Finance minister Professor Mthuli Ncube in the Parliament Building in Harare presenting the national Budget on Thursday. Ncube, who unveiled his maiden budget last Thursday following his appointment in September, told a Confederation of Zimbabwe Industries (CZI) post-budget seminar in Harare that the country was generating enough foreign currency, but the funds were being lost through leakages. This followed criticism that the budget did not address the question of currency of use and the exchange rate. 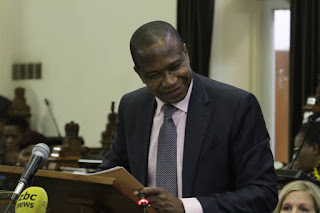 Ncube’s budget statement did not mention any movement towards currency reform, insisting the bond note and real-time gross settlement (RTGS) balances were at par with the US dollar. “Zimbabwe has no shortage of foreign currency,” the minister told the CZI seminar. What we have is a problem in the netting of foreign currency that is coming in. Finance permanent secretary George Guvamatanga told the seminar that Zimbabwe had generated $5,2 billion in foreign currency by October 12. Guvamatanga said countries that generated less foreign currency compared to Zimbabwe were not facing similar problems. “The ($5,2 billion) does not include the merchandised exports, official diaspora remittances and money from development partners,” he said. “A country like Kenya, which has three times our population had merchandised exports of $4, 7 billion, but they don’t have foreign currency shortages. Guvamatanga said one way of addressing the foreign currency shortages was to tackle fiscal indiscipline. He said by March next year the government would have dealt with the problem of ballooning RTGS balances, now estimated at over $9 billion. “We are saying let’s start by addressing the indiscipline and as long as trade is closed, there won’t be additional money to chase the US dollar,” Guvamatanga said. He said by February or March next year RTGS balances would cease to be a factor in the currency matrix. Last month, shortages of foreign currency saw fuel queues resurfacing and the country was hit by an acute shortage of basic commodities and medicines. Meanwhile, industrialists said Ncube could have done more to cut government expenditure and comprehensively deal with privatisation of loss-making parastatals. Former CZI president Joseph Kanyekanye said the government could have cut civil servants’ allowances instead of basic salaries to significantly reduce the wage bill that gobbles 90% of revenues. Ncube’s budget proposes to cut salaries of top civil servants by 5%, which will save the government $91,8 million. The government will also retrench 3 188 youth officers. Ncube widened the budget deficit forecast for this year, exposing the dire state of public finances following a spike in spending by President Emmerson Mnangagwa’s government before his election win in July. Mnangagwa, who has announced austerity measures to reduce the deficit next year, is trying to convince investors and ordinary Zimbabweans that he will revive a once-promising economy after decades of missteps under his predecessor Robert Mugabe. But a chronic currency crisis has stifled businesses and left the poor struggling to buy basic goods. The budget deficit is projected to reach 11,7% of gross domestic product this year, compared with a previous forecast of 3,5%. The budget also projected lower economic growth of 4% for this year, from 6,3% previously. Mnangagwa’s ruling Zanu PF raised salaries for civil servants and handed out free farming inputs to rural voters ahead of a tightly-contested poll. The deficit is forecast to fall to 5% next year due to cuts to civil service bonuses, a new tax on electronic payments, higher excise duty on fuel and the retirement of government workers, Ncube said on Thursday. The government has since 2013 failed to meet its deficit targets and all eyes will be on Ncube to see whether he can contain government spending. Growth is forecast to fall further to 3,1% next year due to the expected El Nino-induced drought that is seen hitting agriculture production, Ncube said.